Not everyone can afford a natural granite or marble kitchen countertop, but just about everyone can appreciate the luxurious look of stone in the kitchen. In the old days, inexpensive laminate countertops that tried to pretend to be stone were merely obvious imitators, but new manufacturing techniques have helped laminates to close the gap between themselves and their more expensive mineral competitors. Modern photographic imaging makes stone-look laminate countertops more convincing. At one time, laminate countertops achieved the look of natural stone by incorporating a photographic reproduction of stone that sometimes looked like the authentic material and sometimes looked like a poor photograph of stone. Newer laminate products, however, take advantage of new technologies to achieve a more realistic illusion. Improved imaging technology produces images that look better, and large images avoid the undesirable tiling effect caused by a small image that repeats over and over across the surface of the countertop. Some laminates use a textured surface to mimic the pits and voids in real stone, and laminates with consistent color from top to bottom minimize unattractive dark lines at the edge of counters. Newer laminate countertops can take advantage of edging options that make them look less like older laminates. 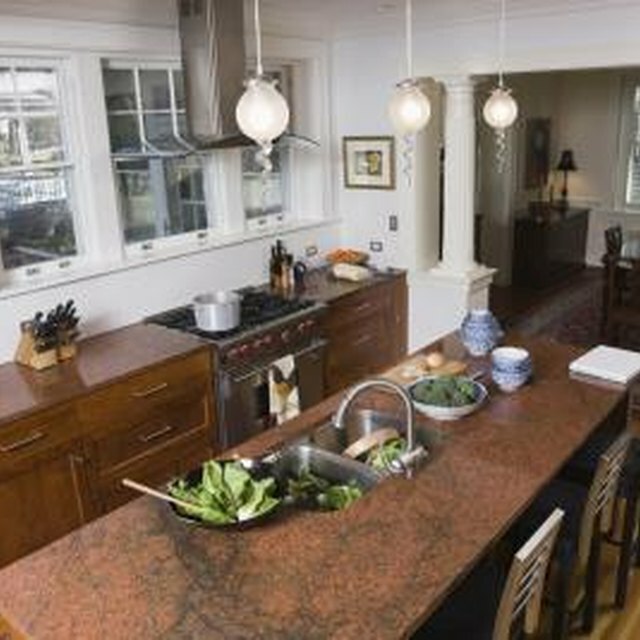 Unlike the familiar square or beveled edges, bull-nose or waterfall edges wrap around the edge of the countertop, eliminating the joint line that is characteristic of laminate counters and, at the same time, replicating edge treatments that are common on stone or other solid-surface countertops. The primary advantage of laminate countertops over natural stone, engineered stone or solid-surface materials such as Corian is cost. Laminate countertops can cost as little as one half as much as solid-surface countertops and as little as a third as much as natural granite countertops. Natural marble countertops may cost nearly 10 times as much as laminate countertops. Modern high-quality laminates will cost more than basic laminates, but even the highest quality laminates are considerably less expensive than other material options. In addition to being cheaper than stone, laminate countertops have some other advantages. Laminates are not porous like stone and are less susceptible to staining. They are easier to install and easier to replace if damaged. However, laminates are considerably less durable than stone countertops. Laminates are vulnerable to damage from heat and scratches, and harsh cleaners may damage a laminate surface. Visible seams and edges give laminate an aesthetic disadvantage, and sunlight may fade its finish over time.